Be a Scientist-over 1200 visitors, youth to adult, joined UC HAREC & CE staff for a fun filled day celebrating 100 years of science and service. The May 8th activities geared for youth were also a big hit with adults. Presentations on topics such as bees, soils, gardening, and water were provided by Master Gardeners and CE Advisors. Kudos to Program Representative, Gwyn Vanoni for leading this amazing event. Sustainable You! Two train-the-trainers workshops were completed. HAREC and Desert REC staff as well as community partners were trained on this pertinent curriculum created by Dr. Roslyn Brain, University of Utah. A week long Sustainable You! summer camp scheduled for June will be delivered by UC intern, Chris Massa. 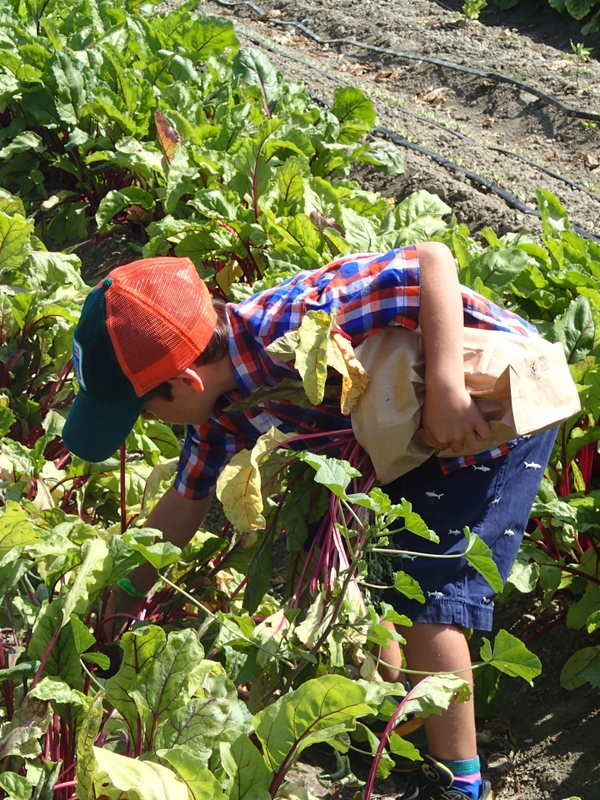 Student Farm-a successful first year ended with a celebration attended by parents, siblings, school administrators, and Hansen Advisory Board members. 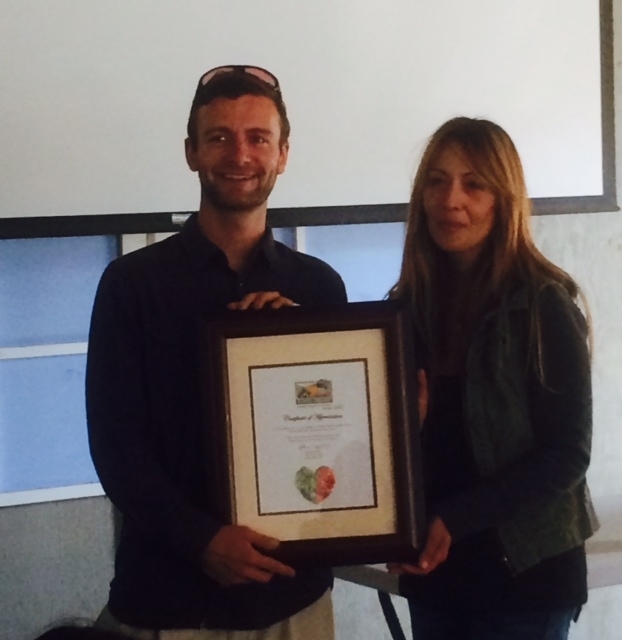 Bonnie Weigel, Food Share, CEO presented the Center and students with a certificate of appreciation for the near 800 pounds of produce grown, harvested and donated to the food bank which serves hundreds of individuals and families in need county-wide. From Watersheds to Planter Beds-a Water Education Program-developed by REC sponsored intern summer 2013, this timely themed new field trip kicked off to the delight of our young visitors. 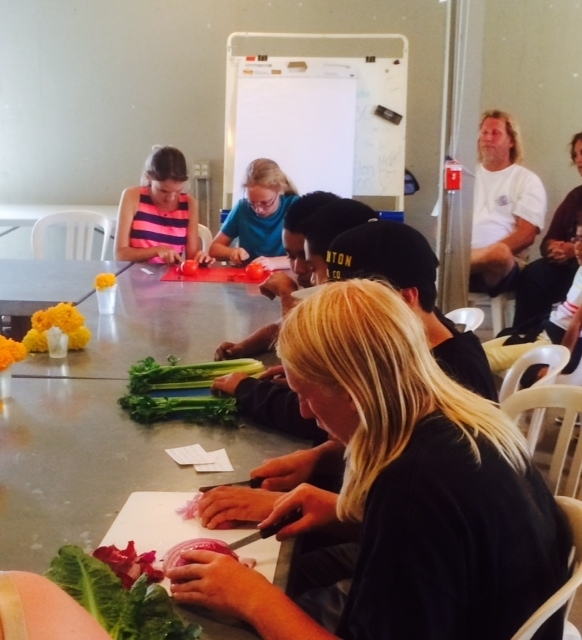 Individual components of the program will go on the road as 4-H Classroom Outreach offerings in the fall. 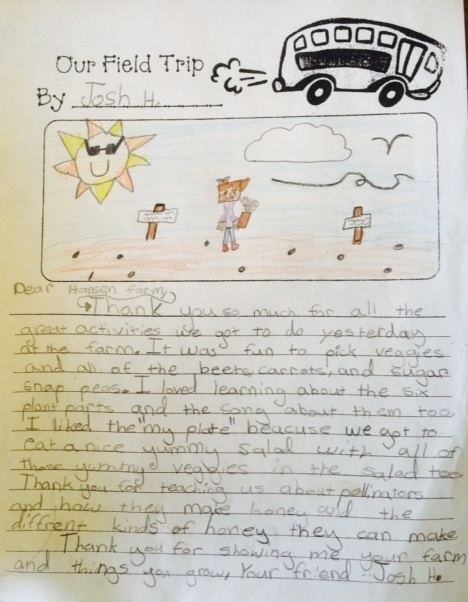 4-H Field Trip, Classroom & Afterschool Outreach-with the help of our treasured volunteers, Food Corps service member and staff, spring youth outreach soared to 1999 and ages reached ranged from Preschool to 8th grade. The season is just ending but field staff are already busy preparing the farm for new fall crops and displays. Stay tuned for posts about exciting new research projects beginning over the summer. Fall Fun at the Farm! 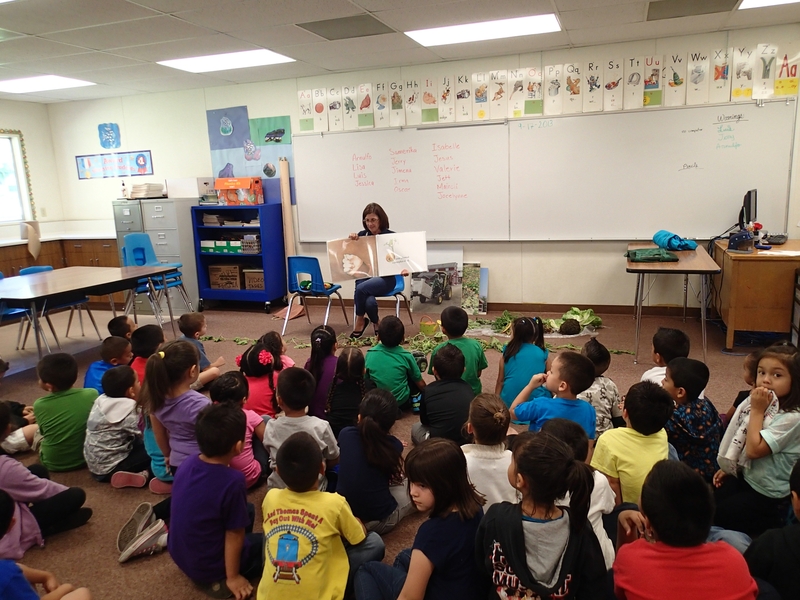 On Friday, September 6th, HAREC launched the 2013 fall education season by piloting From Watersheds to Planter Beds, a water education program developed with the help of our summer intern, Lauren Martinez. The central theme of the program centers around four questions—why is water important? What impact does water have on the world? How is water significant to agriculture? How does Ventura County receive and use water? Eager beta testers from Briggs School located across the street from the Center arrived with plenty of enthusiasm. The 6th grade science students tested activities and games that focused on five key topics: water cycle, evapotranspiration, soils, watersheds, conservation. The activities were well received. Students completed evaluations rating each activity and described something they had learned. Some students offered suggestions on how to make the activities better. All students gave the program high marks for FUN! 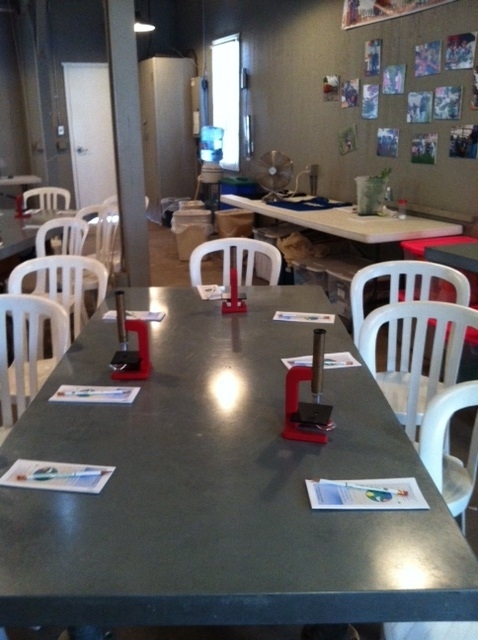 4H Classroom Outreach and Farm Field trips for grades K-3rd is well underway. Extenders are deployed weekly to classrooms throughout Ventura County. The most popular fall lesson ties language arts and science standards for Kindergarten and 1st graders. 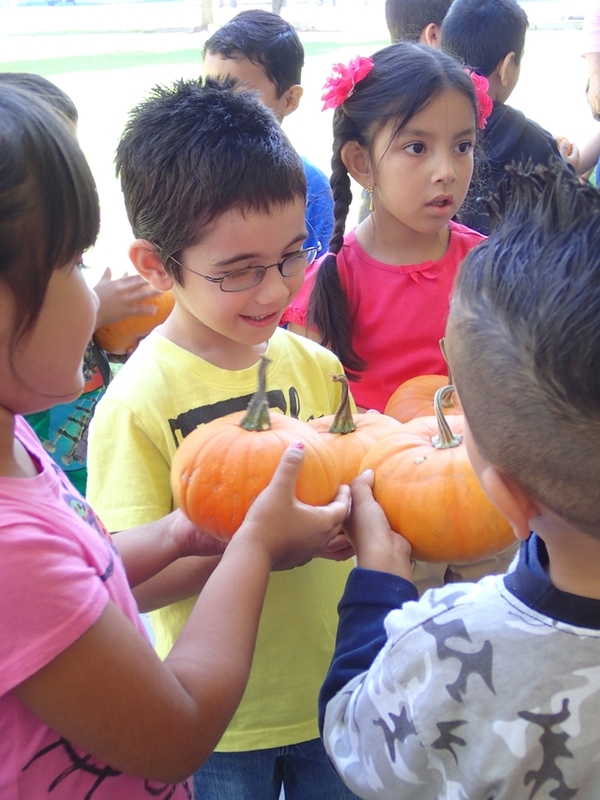 Based on a classic children’s book, Pumpkin, Pumpkin by Jeanne Titherington, students explore the life cycle of a pumpkin from seed to pie. One of the favorite activities is touching a real pumpkin vine brought into the classroom from the farm. School buses deliver 2nd and 3th graders excited to participate in the agricultural literacy field trip that repeats spring and fall. 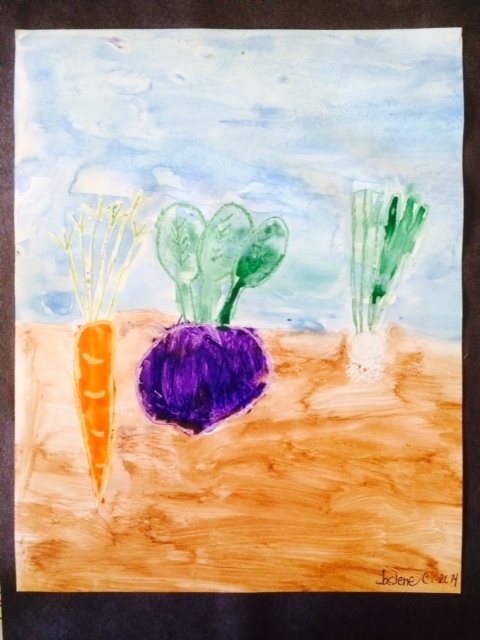 The farm is transformed with seasonal plantings. This year, raised beds teaming with pumpkins and other winter squash varieties provide an opportunity to explore cucurbits. Students (and adults) enjoy comparing and contrasting the flowers, leaves and learning about the nutritional value of this plant family. 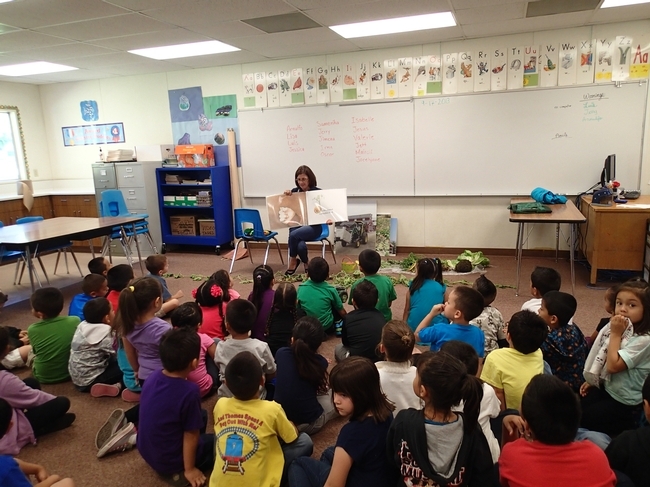 Over 2200 youth from Ventura County schools will participate in 4H Classroom Outreach and Field Trip programs which run through the end of October. Small pumpkins to take home produce big smiles! 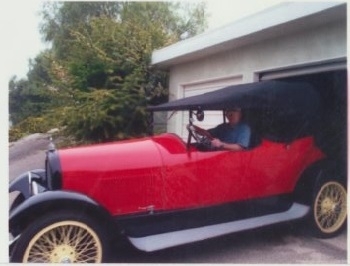 A Marmon, Thelma Hansen’s personal vehicle, was endowed to the University in 1993 as part of the Hansen estate, a major funding source for UC HAREC (http://ucanr.edu/sites/hansenagcenter/). 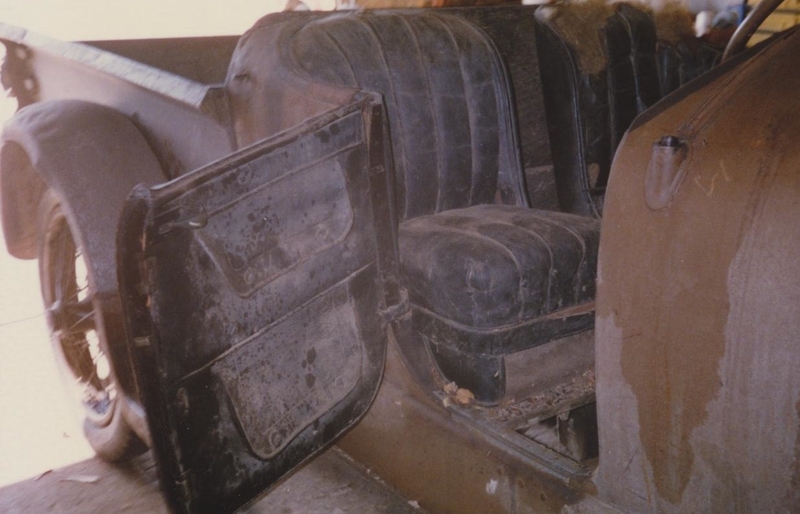 The car with an interesting history including being remodeled into a pickup truck, fire, theft, and abandonment in a storage shed for 50 years, was needless to say, in disrepair and barely recognizable. A talented Moorpark rancher and auto enthusiast by the name of Charles Bedford Schwabauer came to the Marmon’s rescue. 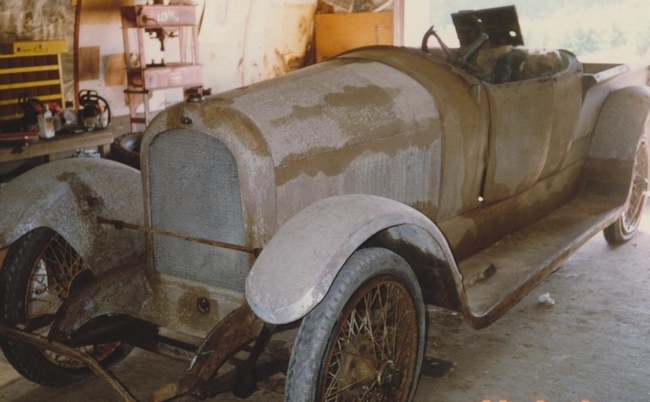 Charles volunteered countless hours to meticulously restore the antique car to its original grandeur worthy of the reputation as a reliable, speedy, and upscale means of transportation of the era. The gleaming 1917 Marmon Model 34 Cloverleaf Roadster is currently housed and on display at the Murphy’s Auto Museum located in Oxnard http://www.murphyautomuseum.org. The staff of the UC Hansen Agricultural Research and Extension Center is deeply saddened by the passing of Mr. Schwabauer and would like to acknowledge his generous contribution to the University. 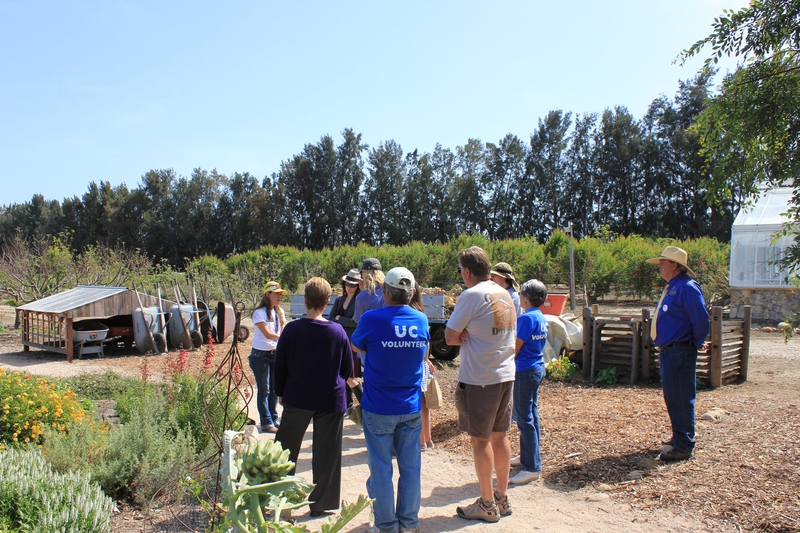 Dr. Rachel Surls, Sustainable Food System Advisor from UCCE-Los Angeles, coordinated a Ventura County urban agricultural tour for Will Allen and guests which included a stop at UC HAREC. The primary purpose was to meet with representatives of the Abundant Table organization and see their operation located at the Center. Abundant Table/Join the Farm Project currently rents approximately 3.5 acres for the purpose of cultivating a diverse range of fruits and vegetables using row crop organic farming. In addition, the project offers an internship program for youth and young adults with emphasis on cultivation, marketing, and sales through their Community Supported Agriculture and Farm to School institutional sourcing. 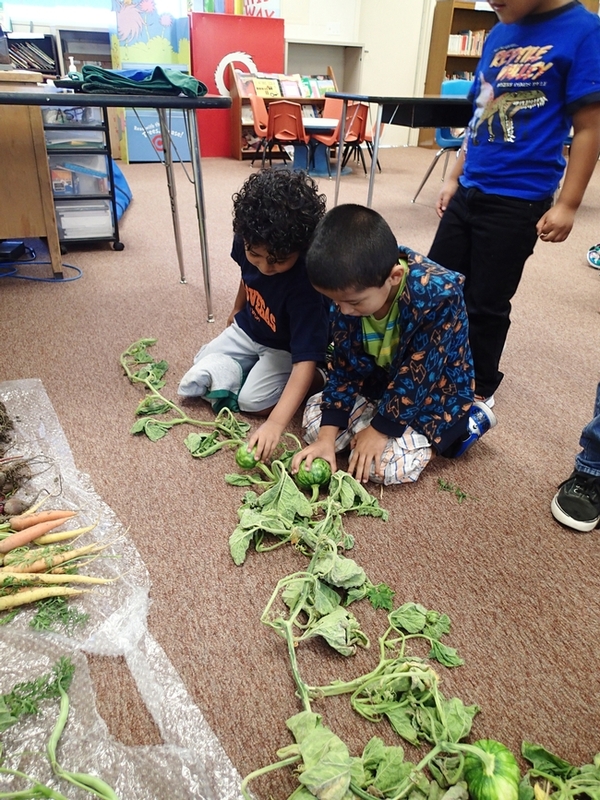 Dr. Surls collaborates with Mr. Allen on a multi-city study of urban farms. Allen is Co-Principal Investigator for the Community and Regional Food System (CRFS) Project, a 5-year nationwide study funded by the USDA Agriculture and Food Research Initiative (www.community-food.org). He is founder and Chief Executive Officer of Growing Power, Inc., a 20-year-old sustainable agriculture organization based in Milwaukee, with project offices in Chicago and Madison, Wisconsin (www.growingpower.org). A farmer of more than 30 years, teacher, and community activist, his work is highly regarded and widely emulated and the Growing Power training sessions are nationally recognized. Allen has been the recipient of numerous local, state, and national awards and recognitions, including a 2008 MacArthur Foundation Genius Award. In 2012, he was invited to the White House to join First Lady Michelle Obama in launching “Let’s Move!” her signature leadership program to reverse the epidemic of childhood obesity in America. His autobiography, The Good Food Revolution, was published by Gotham Books in 2012. Mr. Allen and guests also toured the HAREC facility with Director, Jose De Soto, and learned about other agriculture related research and education activities available at the Center.